Undercover Border Police officers arrest three Arabs participating in violent riots. 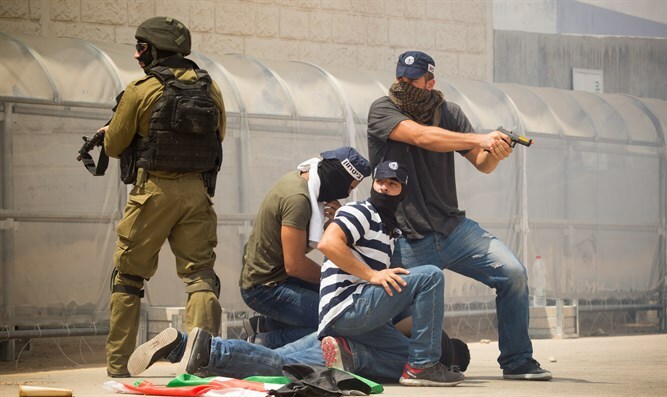 A Border Police unit posing as Arabs on Friday arrested three Palestinian Authority (PA) Arab rioters in the Jerusalem-area PA village of Abu Dis. The unit, "Mistarvim," is a counter-terrorism unit whose officers operate undercover in Arab areas. During disturbances in the area, dozens of PA Arabs burned tires and threw rocks and firebombs at security forces. The plainclothes, undercover Border Police officers participating in the riot succeeded in arresting 3 of the rioters "red-handed." One of those arrested had a slingshot in his hand, which he used to shoot rocks at the security forces. The three arrested, all residents of Abu Dis, were transferred for interrogation by the security forces. IDF operations near Shechem (Nablus) continue as security forces work to locate the terrorists who murdered Rabbi Raziel Shevach, 35, near Havat Gilad on Tuesday evening. Shevach left behind a wife and six orphans, the youngest of whom is ten months old.